April 3 is the birthday of Bilkent University’s founder, Prof. İhsan Doğramacı (1915–2010). 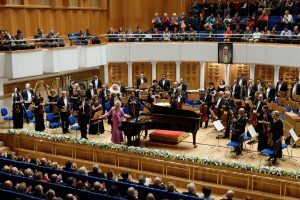 Each year, the university community celebrates the occasion as Bilkent Day, with events including the annual Bilkent Day Conference and a commemorative concert. This year, for the first time, an open meeting of the Board of Trustees was held after the conference as part of Bilkent Day. All of the day’s events took place in the Bilkent Concert Hall. The Bilkent Day Conference opened with a presentation on “The State of the University” by Bilkent’s rector, Prof. Abdullah Atalar, in which he gave a summary of the year since last April 3, highlighting the university’s most recent academic, educational and research accomplishments. The presentation included various statistics concerning students, faculty, research, awards, university budget items and world university rankings, as well as information on recent initiatives, actions and investments, such as the approaching completion of the new dormitory and the planned construction of outdoor sports facilities behind the Dormitories Sports Hall. “While Robert College received substantial support from the Rockefeller Foundation, the person in Turkey who inspired the most foundation support during the 1950s and 1960s clearly was Dr. İhsan Doğramacı, who came to the foundation’s attention in 1955 as a newly appointed professor and head of the Department of Child Health and Pediatrics at the University of Ankara Faculty of Medicine…. “Doğramacı clearly impressed foundation officials as someone with the energy, drive and determination necessary to make an impact upon medical education in Turkey. Following Prof. Atalar’s presentation, several members of the university Board of Trustees offered brief remarks concerning Prof. Doğramacı’s ideals and continuing influence.